The Sacred 2 Addon “Ice & Blood” contains a crystal area which has, in my eyes, pretty nice crystals. Or let’s say, they have very nice reflections. Of course we don’t have any realtime raytracing and also no updating cubemaps. But as you see, there is some reflection going on. 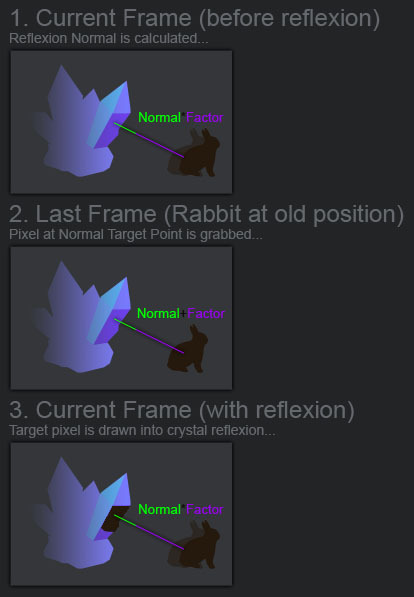 I try to explain, what was explained to me: The trick is, to use the last rendered frame as a reflection source. 1. You would take one pixel which shall get a reflection on. This pixel has a normal (screen space) and you can modify this normal by a factor. 2. You take you last rendered frame and look where the new, modified normal points at. As a result, the reflection is always 1 frame later in time. But i think that’s not really noticeable. Below i made a shot where you can clearly see how objects and characters are taken and used as reflection. What i really like is, that even if a NPC is right behind a crystal, it doesn’t look wrong. In that case it looks like a refraction instead of a reflection. Also there is nothing like “only big objects are rendered into the reflection to save performance”. But of course, this works only for strong “scattering” elements like theses crystals. I think you would notice the wrong perspective of the reflection very fast if this technique would be used for water. This entry was posted in Game Art Tricks and tagged Reflection, Reflexion, Sacred 2 on 3. February 2013 by Simon. Actually, it kinda does work in special cases, even on a sphere. I used the same approach for a game I’ve been working on with some friends of mine. Ps. : I really like what your doing here :) keep it up! This is awesome! I want to play it! With others. I love how the environment comes from “below” the horizon. Do you have Skype? I would have some questions. Yep, I got skype :). I’ll write you an email once I get home tonight. First let me say I really appreciate what you do. As a game dev/design newbie, your posts are very inspiring, and your Render hell is really an interesting piece too. I wish there were more learning sources like your site. As for the matter of my comment here, the “reflexion but not quite reflexion” in this subject reminds me of something that has bugged me for a while. I even recently wrote an article about that, in part inspired by what you’re doing here. It’s and oldie : Tomb Raider II on Psx. Most of the blade objects in this version of the game do have a reflexion lookalike, but it can not possibly shaders with regards to the vintage hardware it runs on. There also is a thread on the psxdev.net forum, which you can find a link to at the end of the article. I would very much be interested in your ( or anyone with insight for that matter ) opinion about this.